Two weekends ago, we were desperate to get out of the house with the baby. So naturally, we ended up at Home Depot. As the baby snoozed away, we surveyed aisle after aisle, discussing home improvement projects and whatnot. So adult of us. We debated over which ceiling fan to get for our newly furnished guest room and after staring at all of the display fans on the (very high) ceiling we settled on our decision, but not before causing neck pain. Who knew there were so many decisions to be made on ceiling fans – blade length, blade width, blade color, blade shape…not to mention the look of the light itself. And of course Mr. Moneybags, always trying to go cheapy-cheapy on me. We then happened upon an end cap display for snow poles. You know, the poles people sticks in the ground to guide the plows away from their lawns, sprinkler systems, landscaping, etc. People who live in unfortunate places in the wintertime know about these poles. People like us. Last year, was, as we all know, a very brutal winter. It also happened to be the winter following our springtime project of landscaping. So imagine our delight when the plows took out the sprinkler heads and tore up the lawn and landscaping that was within 2 feet of the street. Just lovely. So after the ceiling fan debacle, we moved on to the debate over what size poles we needed this winter. We had the choice of 4 foot or 6 foot. But sadly, not much debate was to be had and the practical side of us both knew that the 4 foot poles were likely to be covered by snow plows and the 6-footers were necessary. The 6-foot poles are officially lining the property in front of the house as of yesterday, because sadly, we’re about to get plenty of snow. Or so they say. We woke up to a dusting and frigid temps…and that’s more than enough. The gentlemen packaging my crab legs at the store yesterday wished me ‘happy holidays’ yesterday. The red and green baking goods are out. Christmas Ales are replacing the pumpkin ales. Christmas music is ringing through department stores. It’s a-comin’. This weekend we probably won’t be so desperate to leave the house that we’re willing to take a family trip to Home Depot. Instead, you can probably find me at home cuddled up with some tea and a hot bowl or something. 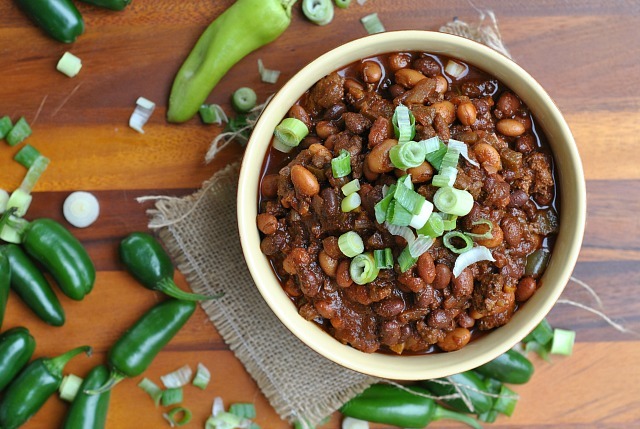 Chili, preferably…and this chili would be a top choice. Katie’s Chili is entry #7 into this year’s chili contest and it is absolutely phenomenal. I do say, this one will be tough to beat! Slightly sweet and smokey with the perfect amount of heat. Loved it, loved it! In a large, nonstick pot over medium-high heat, brown the meat until no longer pink, breaking up with a wooden spoon. Add the onion, bell pepper, and garlic; stir and cook for about 3 minutes. Reduce the heat to medium, and season with Worcestershire sauce, chili powder, cumin and oregano. Allow to cook an additional 5 minutes, stirring occasionally. Reduce heat to low, stir in the beans, chili sauce, beef broth, and beer. Cover, and simmer for about 35 minutes. Serve hot. 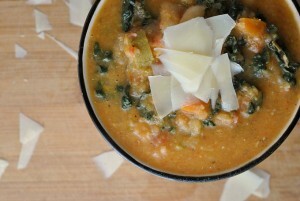 The original recipe is from Katie D.
Stay warm if it’s cold near you, too – brrr!! 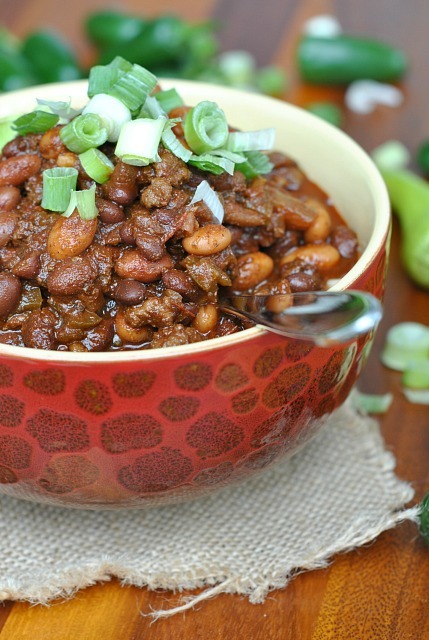 There’s nothing better on a cold day than a comforting bowl of chili! Okay, I am totally all over this one too Nicole – except leaving out the stinky onions. 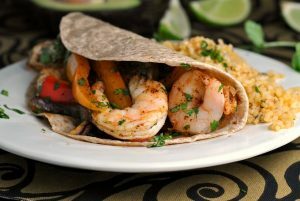 I love her addition of bottled chile sauce, and I am going to have to look for ancho chili powder – not sure how that has eluded me all this time! You and your onions 😉 This is really random, but any chance you want to meet up for lunch next Wednesday? I know you’re working, but I can drive to where ever 🙂 I’ll have Shea! Let me know! 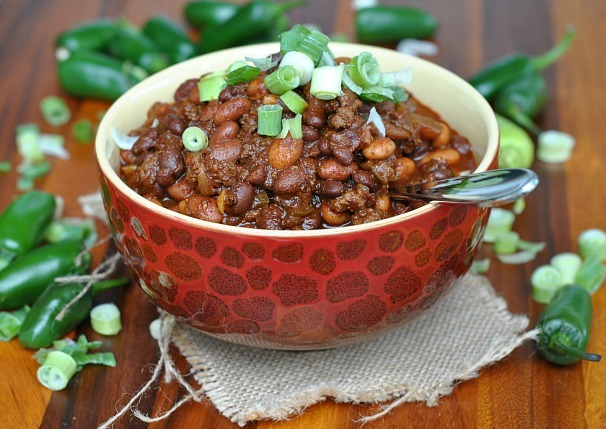 Always looking for good chili recipes!! 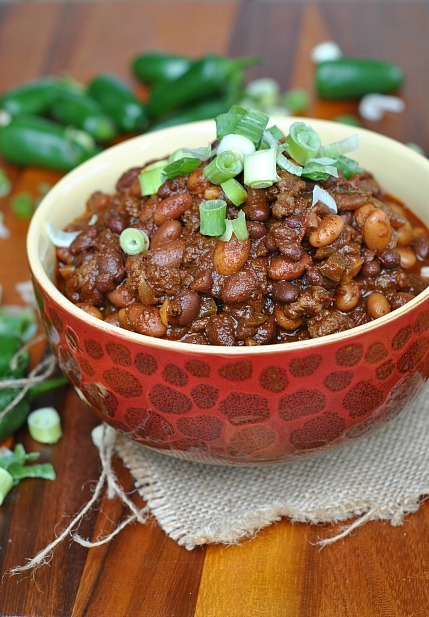 Nothing better then a comforting bowl of chili on a cool fall day! And, I should add, I love your blog–I’ve been a long-time reader!